The dog is a relatively popular motive, since also many hobby artists like to illustrate their own quadruped. You can often read the question “How to draw a dog” in forums. In this little tutorial I would like to show you how to draw dogs. However, I will not describe a standard procedure in this manual. Depending on the perspective from which you want to draw a dog and depending on your posture, the motif may look completely different. Therefore I will primarily try to give some tips and hints on how to draw a dog. As always, it is important to have a close look at and study the drawing object. See the drawing below. In it you can see a dog in side view. 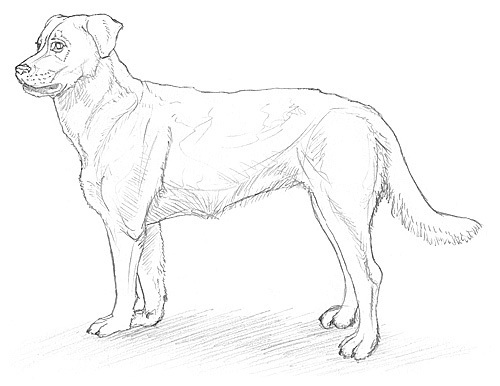 Study the proportions of the dog in the drawing if you want to learn to draw a dog yourself. Especially when it comes to a general approach to drawing dogs, you also have the problem that there are many different breeds. The different dog breeds sometimes look very different. The characteristic body shapes show a similarity, but nevertheless you have to look very closely again and again when you draw. 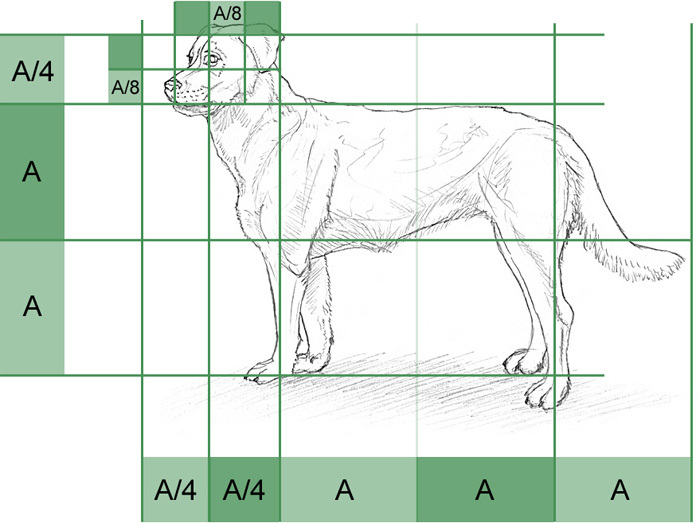 A possible approach for the representation of a dog is the examination of the proportions with the help of orientation lines. In the picture below you can see how I measured a dog. I have tried to emphasize the most important proportions by equal length measurements. The orientation lines are here always in the (constant) distance A or a fraction of A (A/2 and A/4). The total height of the dog can be represented by 2.5 times the length A (H=2.5*A). The shoulder height is 2*A. The length without rod is about 3 times the length A (L=3*A). The length with tail is approx. 4*A – depending on the posture of the tail. The length from the joint of the forelegs to the hip joint is about 2*A. The dog’s head is about 3/4*A (or 0.75*A) long. The muzzle is about 1/4 long; the length from the eye to the ear is 1/4 and the back of the head (about the length of the ear) is 1/4 again. The height of the head is about 1/2*A. The midline is under the eyes; below is the muzzle, above are the eyes and forehead. Dogs draw with the help of a skeleton representation. Another approach to drawing dogs is the skeleton figure method – one could also speak of a stick figure drawing. The method is often used when it comes to drawing a dog or other animal in motion or simply in different postures. In the skeleton representation, the individual limbs and the most important joints are represented. This visualizes how a dog can move. This makes it much easier to draw the dog in other postures as well. In the drawing below you see such a skeleton representation, in which additionally the contour of a dog is deposited. The three ellipses, which are distributed over the body, are the shoulder blade, the chest and the hip. The points mark the joints.